Reports have been coming in about a tornado north of Amboy on Sunday, July 5. The twister rearranged lawn furniture, tore up some fences, and ripped up some roofs. No injuries were reported. Starlene Javier, who works at the Community Center, said it was more of a "dirt-nado." 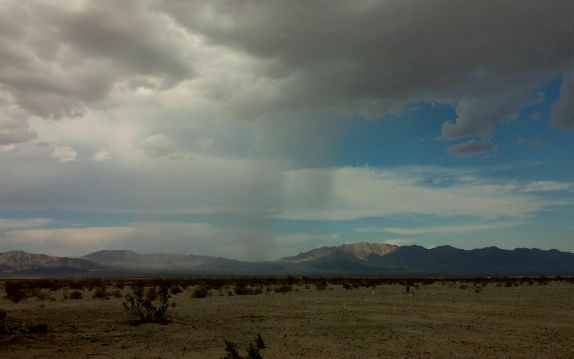 A sun shower to the left. I was driving that day on Highway 62 and took this picture, looking north. I could see a sun shower to the left - a monkey's wedding, but looking at the pictures now I wonder if the two dark areas to the right were not funnels forming. 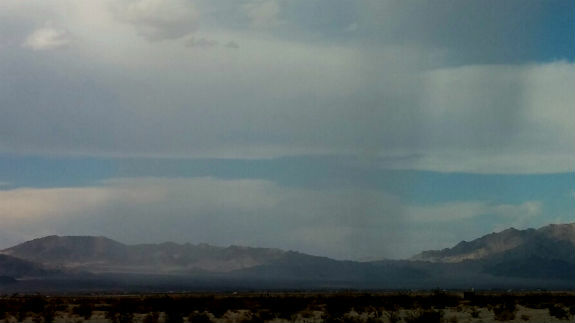 Funnels forming north of Amboy? Please, if you have any photographs of the damage, or stories you want to tell, comment below or send them to me at teresa.sitz@gmail.com. I think I remember Don noticing this far off down the valley, but it didn't get near us (Valley Vista @ Encanto).